Nothing in the North has been groomed, this will more than likely need to stay this way until the first part of the new year. We are working hard to get the new snowcat ready to send out as well as getting the trails cleaned for the third and forth times this season. We apologize for the inconvenience, we are doing what we can to get everything up to the amazing conditions that we are known for. Caution is advised while on the trails as there are hanging trees and in some parts trees crossing the trails. Both Eagle River and Groat creek staging area’s are open and snow has been plowed. The South trails including Summit and Goodwin have been groomed, they are typical early season condition and extreme caution is advised, there are a couple of dirt spots, icy sections and large bumps. If you ride resposibly there is a lot of fun to be had. The North trails have not seen a groomer yet but we hope that will happen by then end of this week or early next week. Extreme Caution is advised when crossing any waterways including rivers, creeks, ponds and lakes. 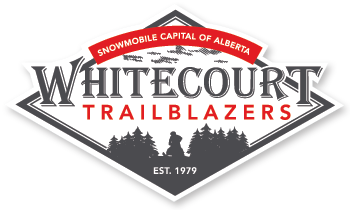 Also note that the Whitecourt Town bylaw permits sleds to ride from town to the trail system on designated trails ONLY!! No overnight camping at the staging area’s or in the warmup shelters. Trails are open but not groomed. We have been busy working on getting the snow cleared at both the Eagle River staging area and the Groat Creek staging area. Trails are open, but extreme caution is advised as we are just starting the grooming operations for this season. Most of the trails are ungroomed, some trails have had the creeks and valleys filled in and this results in a hard trail surface that can be a tad bumpy. A few crews of Trailblazers were out on Saturday and did some more trail cleaning. The majority of the trail system has been cleaned at least once. Some hangers and natural hazards still exist. Grooming will proceed as conditions allow. Creeks, lakes, and rivers are not totally frozen. If you are out riding, carry a hand saw and clear some hangers to help the groomer get through. Please report any problem areas to Aaron or Dan. Trailblazers Monthly Meeting on Wednesday, Dec 10. 7:30 pm downstairs at Legion. Thanks for purchasing ASA trail passes to support organized snowmobiling. The trails will officially open on Saturday, Dec.6. Both Staging Areas will be plowed and open. Join the Trailblazers for the opening ride at 10am on Saturday. A couple of trails still need to be checked and cleaned but it will be a great day for a sled ride. Bring a saw if you can. Meet at Eagle River Staging Area. Refreshments after in the warmup shack.